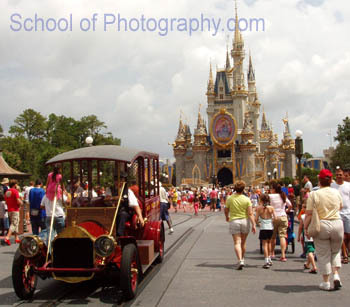 A carnival or amusement park can range in size from a few rides temporarily set up on the side of a road to the world renowned parks such as Disneyworld. In fig 1 is probably one of the most famous theme park landmarks in the world. However any park is an opportunity to create some fantastic images. Typically on a day out to an amusement park, carnival, fair or theme park, the camera will be taken along to record the events of the day. If it is a family outing then all the more reason to carry the camera and capture those special moments. What most parks are really about is the rides and amusements. The bigger the thrill these give, the more popular the park. 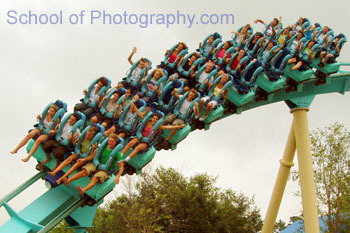 Roller coasters are traditionally the main attraction in any park. They are also generally very accessible to the photographer, usually with the aid of a long lens. The expression on peoples faces and their body language can tell it all in an image. In fig 2 there is every sort of expression presented on this roller coaster ride. Most of these amusements use speed and movement to create the thrill. Therefore photographing them can be sometimes difficult. Motion blur is the main problem but this can be reduced with an increase in shutter speed or using techniques such as Panning. In general, “simple is best” makes a better photographic image. A good image is when the subject is clearly identifiable without any unwanted element attracting the eye within the image frame. This can prove quite difficult to achieve in an amusement park setting. People are milling everywhere and the amenities in the background of an image could cause it to look cluttered. Try to get as close as possible to your subject and fill the frame. For portraits we usually like to include something in the image that identifies where they have been such as the park in the background. However it is better to just find one element that may be enough to identify where you are. In some parks you may find special “sets” designed for people to pose within. 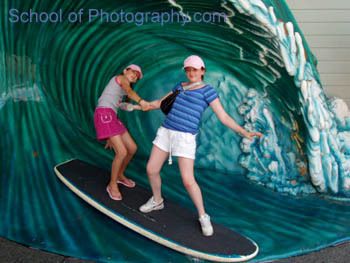 The photo in fig 3 was taken on one such set found within a theme park.